Go ahead and read that title one more time. Go on. Yes. It’s true. I made the brunch to end all brunches. 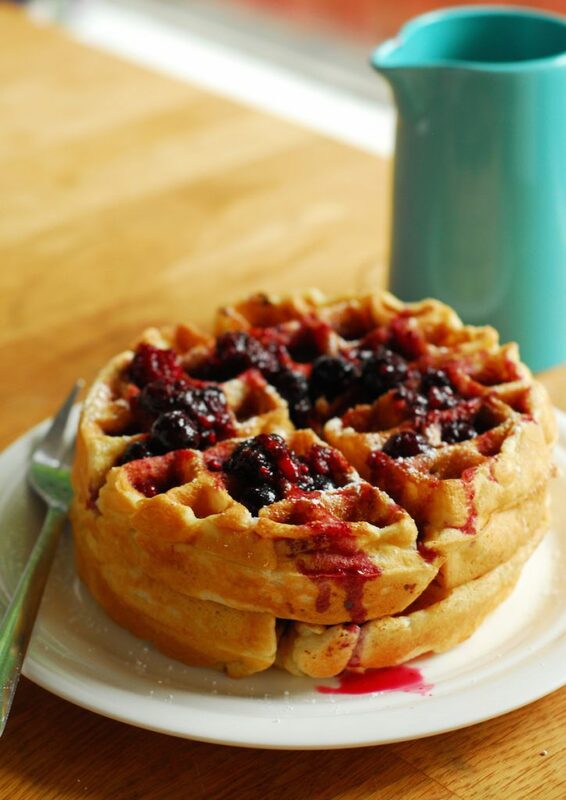 Cheesecake Stuffed Waffles with Berry Syrup. Oh, and have I mentioned that my wedding dress just arrived? And that I’m going to have to get it fitted soon? Let me go run off all the calories I spent the day (literally, the whole day) shoving into my face rull quick. Luckily, we really, actually did join a gym last week. And we love it! Now I just need to calculate how long I’d have to run to burn off the waffle calories and lose weight. Except that I don’t actually want to know that number. 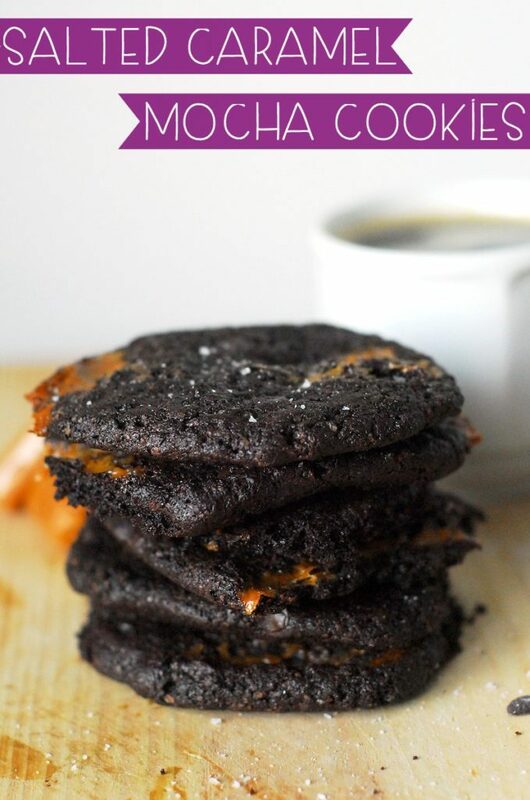 Good news, bad news: this is a semi-homemade recipe, which means it’s crazy easy to make. 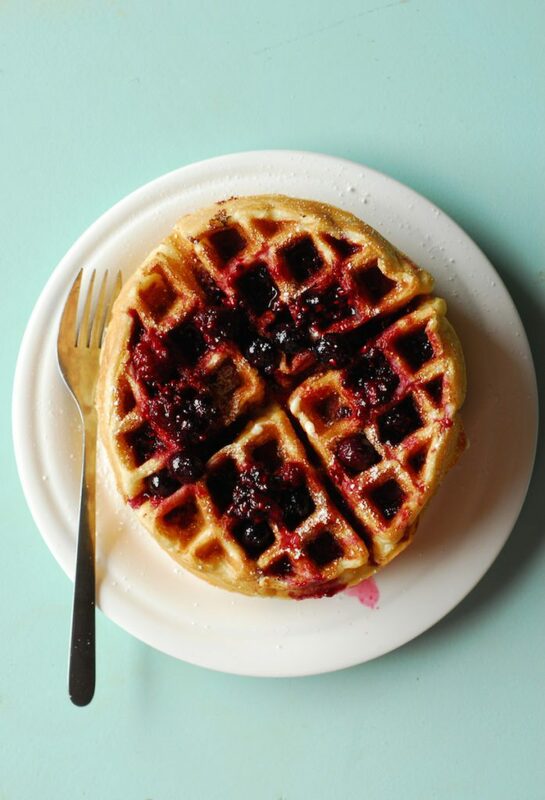 I didn’t make the waffles from scratch (but you totally could!) and the berry syrup has three ingredients: maple syrup, frozen berries (or fresh! ), and lemon juice. The bad news is that since it’s so easy to make, I’m going to be tempted to make it frequently, which means so much running. And I have to tell you, I really hate running. 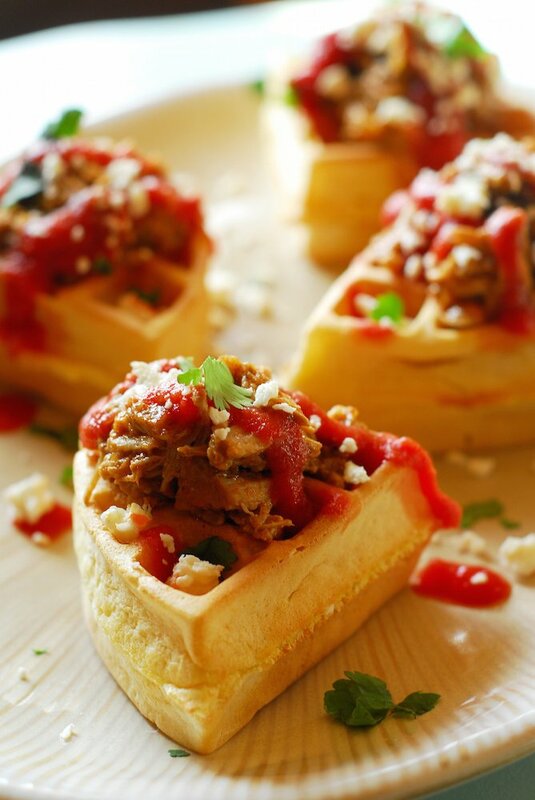 Okay enough of the boring stuff, let’s talk about these waffles. 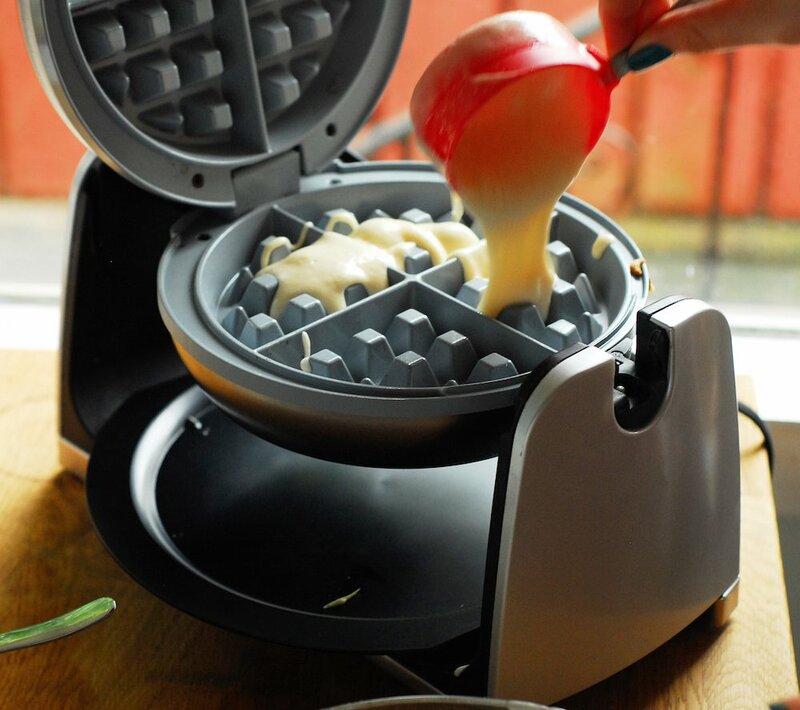 Start out with an excellent waffle maker. I really love the waffle maker I have: it makes big, fluffy waffles that are just a little crispy on the outside. But do you want to see the waffle maker of my dreams??? 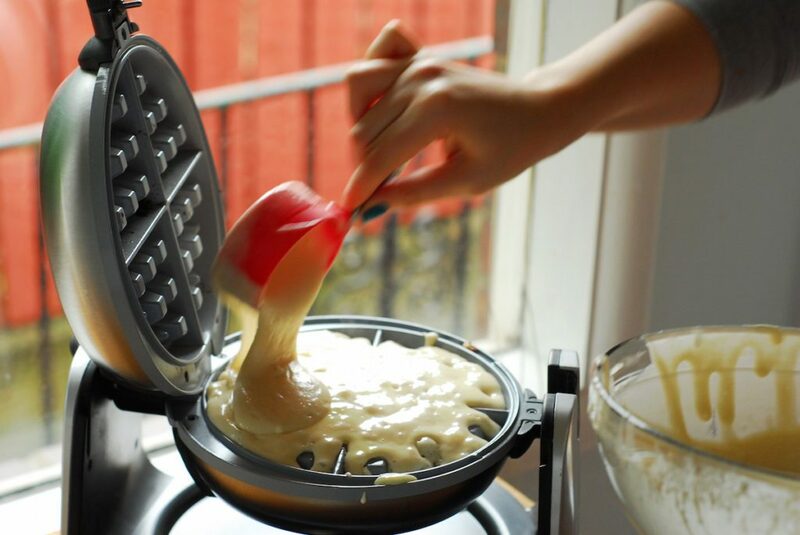 This Double Belgian Waffle Maker. YOU GUYS. Two waffles at once!!! No more longingly watch Fiance eat his waffle while I wait for mine to be done. No more eating luke warm waffles because I wanted to cook them all before starting and the whole process took foreverrr (okay, 10 minutes). If I had that fancy waffle maker, that is. Anyways. 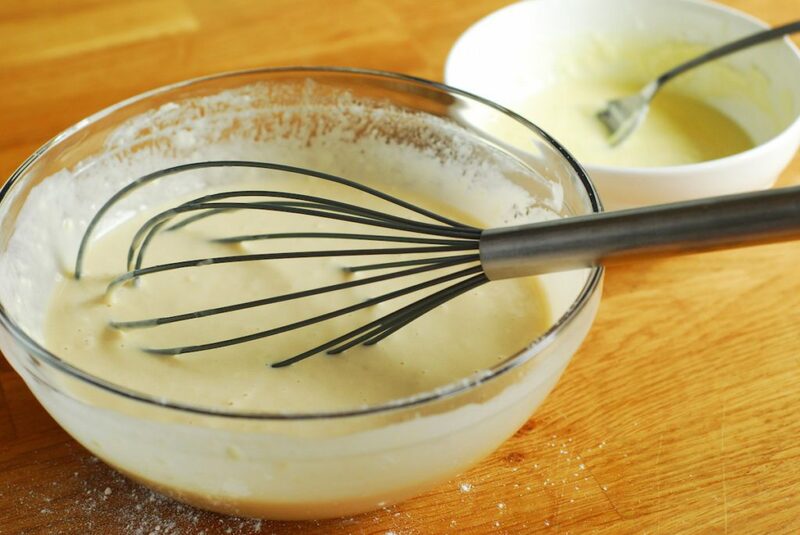 Then you’re going to need to make standard waffle batter (I used a box mix… I know, I know) and a little cheesecake batter. Then just layer them into your preheated waffle iron! Then let ’em cook! Before I started the waffles, I added frozen mixed berries (raspberries, blueberries, and blackberries) to a small saucepan with a bit of lemon juice over low heat and let them slowly break down. Then I added maple syrup and took the mixture off heat to cool. And, of course, poured that (chunky) liquid gold all over the cheesecake stuffed waffles. That’s my handy-dandy orange striped apron you’re seeing there. I have lots of pretty aprons that I like to wear when I have people over, but this is my work apron. It has three big pockets, is super comfy, and goes all the way down to my knees. It’s awesome. Anyways, then I topped them with a little powdered sugar and decided this is how all mornings should be. 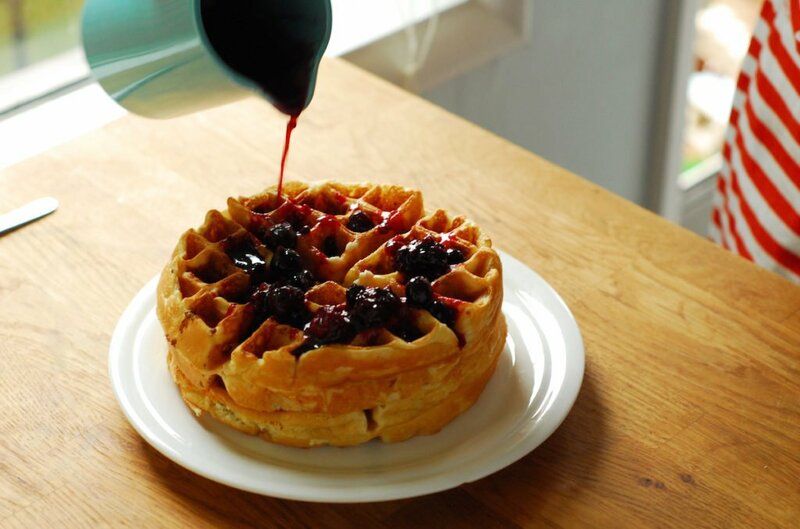 The berry syrup soaks into the waffles in the yummiest, most perfect way. The cheesecake filling isn’t overwhelming and we all already know how perfect berries and cheesecake are. Really, let’s be honest here: this recipe was mostly an excuse to find a way to eat cheesecake for breakfast. But the waffle component was even more wonderful than I expected it to be. The whole thing came together in the most perfect way. So make this for Sunday brunch, or just don’t wait until then and make it tomorrow. I won’t even judge you if you make this for brinner tonight. Because who doesn’t love brinner? In a small saucepan, add the frozen berries and lemon juice over medium-low heat. Let cook for about 15 minutes, or until berries have broken down. Stir in maple syrup and set aside. 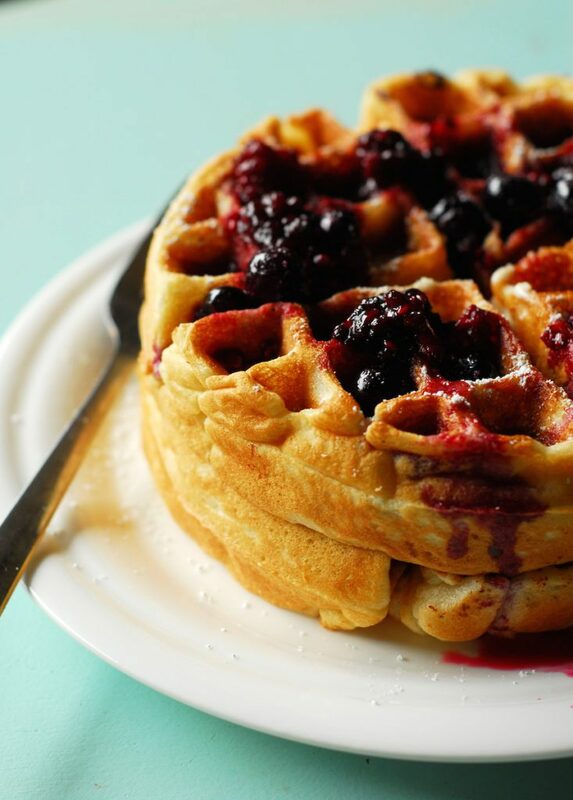 While the berry syrup is cooking, start the waffles. In a medium bowl, whisk together the cream cheese, sour cream, milk, egg, and sugar. Set aside. Prepare the waffle batter according to your package instructions. Preheat waffle iron. 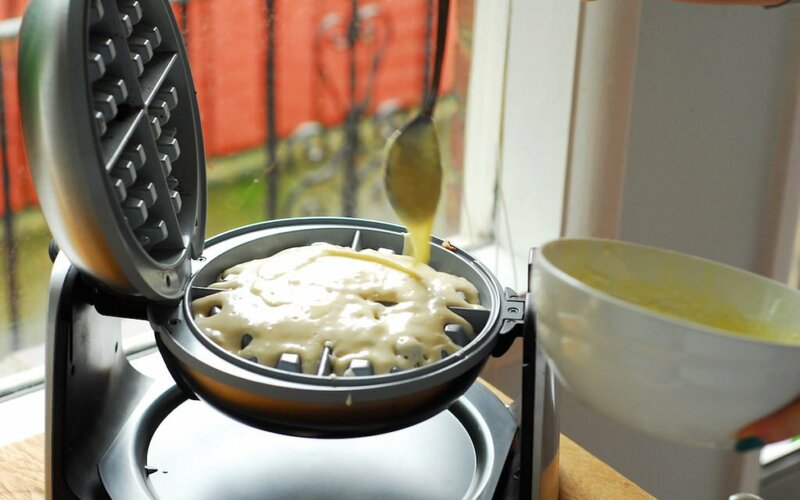 When waffle iron is ready, add about ⅓ cup waffle batter, then ¼ cup cheesecake batter, then ⅓ cup waffle batter to the iron. Close the iron and let cook according to waffle iron instructions. Repeat until batter is gone and all waffles are cooked. 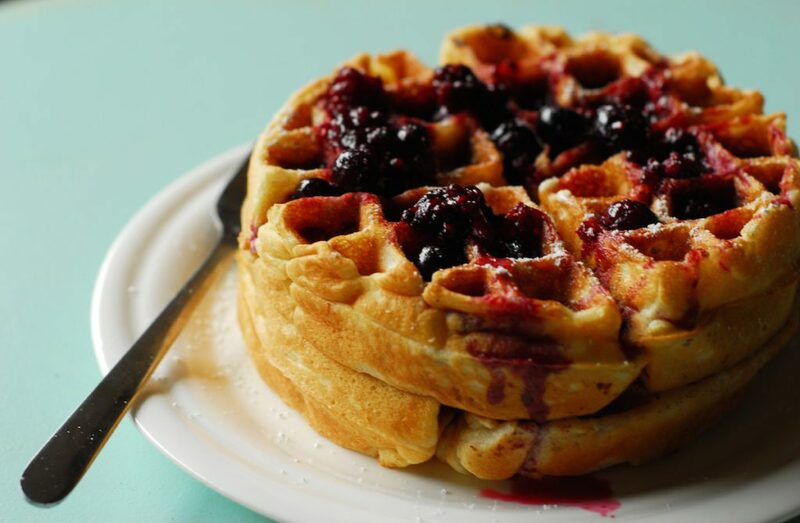 Top waffles with berry syrup and a little powdered sugar, if desired. 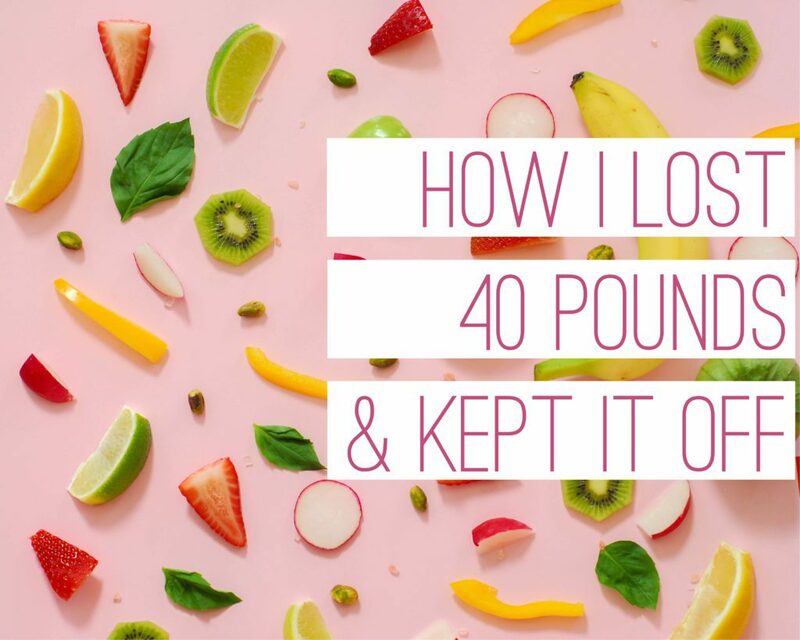 A novel: I lost 40 pounds and have kept it off for 2 years.